It’s really rare to read a piece like this in which the author understands LibriVox so completely: Of Books & The Audio-Phile: An Alternative Approach. No doubt, there is no pleasure quite like reading. Quite like seeing those words on the page for the first time. And no effect quite like it when it comes to altering the brain and expanding it in preparation for the next collection of black ink on a white page. But we must also remember that the oral/aural tradition came first—and listening to those very same words has its own special powers. Somehow it seems more social, more like you’re sharing with someone else, even if that someone is only the person narrating the story. Besides, it’s not such a strain on these aging eyes. Thank you, Michael of http://descant.ca/blog/! And I’ll be podcasting both books eventually, as well. If you want to see the color plates from the art book, go here: http://www.archive.org/details/Book_of_Art_Illustrations_lv. Googlebooks hosts a scan of the little cookbook, which has charming illustrations: When Mother lets Us Cook. In case you were wondering, I finally got my lab results back (2 weeks later) and what I have is, indeed, shingles and not some incurable mystery disease. Yay. I hope you, whoever you are, never, never, never get shingles. It is not serious, but damn, it hurts like hell. I don’t remember if I said this already, but the first sign I had that anything was wrong was a feeling like a bad sunburn on my thigh. This peculiar pain proceeded to travel up and down the right side of my body, here one day, somewhere else the next, until it hit my scalp and the sole of my foot — and then it traveled back the other direction and spent a lot of time on my stomach and upper arms (both of them, not just the right). The blisters and rash only ever appeared on the back of my thigh (and other areas nearby). So that’s the end of the State of Kara’s Health update for today! The ship movement rules in the Seafarers of Catan expansion are vague, to say the least. After much digging at boardgamegeek.com, I found the answers to some plaguey questions. The entire “Observations on Ships” thread is helpful, and in the middle of it is the answer to a question that came up yesterday: Can you move the one and only ship attached to a settlement? Answer: yes. Mayfair Rules Guru: Yes, it is possible that a settlement will be left with no roads or ships connected to it. If you move the only ship adjacent to a settlement to another shipping line (which you may do because that route is “open”), then the settlement would be left barren. Also bumped into a rule variant that sounds good to me: When you roll a 7 and move the pirate, the robber goes back to the desert. If you move the robber, the pirate goes back to the frame of the board. Friday, after Dan bought the Seafarers expansion for Settlers of Catan, he and Simon and Henry played twice. I felt too rotten. But yesterday I felt better so I got to play too! We played twice. I won the first game, and Dan won the second. The second one had a crazy layout — a long skinny winding island — and all three of us had quite a struggle. Dan reached 12 points first, with Simon and me at 11 and ready to win if Dan didn’t! It was very exciting. It looked for a long time as if Dan would leave us in the dust but amazingly we managed to almost catch up — Simon by competing with Dan for Longest Road and getting a lot of territory, and me with a handful of Cities. Great game! Thursday night I took the boys to see “Into The Woods” at the Starlight. We already had tickets and I decided I felt just barely well enough to go. I’m glad I did, ’cause it was a fantastic show and all three of us loved it! I felt pretty bad the next day but it was worth it. Thursday morning I had taken the boys up to Game Empire so Henry could buy the Dungeons and Dragons 4th Edition Players Handbook and a few dice. On Friday Dan went up to Game Empire and bought us the Settlers of Catan: Seafarers expansion. He’d had a lot of fun playing it in Canada. It turned out that the expansion didn’t work with our 8-year-old version of Settlers, so he had to go back to Game Empire to buy the newer version of Settlers, heheh. Henry went with him and bought more D&D dice. Sally and Gary showed up in the afternoon to drop off all the old stereo components from her house. It’s all about 21 years old but as far as she knows it still works, so when we get it set up I’ll have a real radio and cd player and turntable and big speakers and everything! Very exciting. Also on Friday our friend Simon came by — he’s from Australia but has been traveling all over North America on his motorcycle. He’s staying with us for a few days now, which is great! He’s easy-going and super nice. So yeah lot of stuff happened on Friday. I was really tired and still in a lot of pain that night and didn’t want to cook so Dan and Simon went out and brought home In-N-Out and then we watched a few episodes of Arrested Development and I went to bed early, and then Dan brought his laptop in and we watched podcasts and stuff, including the rest of The Guild and also Cute with Chris’s Barf Animation Contest, which made us laugh until we couldn’t breathe. Yesterday Henry’s dear friend Fargo came to visit for a few days. Hooray! He and Henry spent hours in the backyard kicking a soccer ball around and having mock battles of some kind. Dan says boys that age must fight. Fine with me, as long as no one has to go to the emergency room and no more teeth get smashed. Henry chipped two front teeth last year horsing around with Fargo and now he’s got braces so I really will kill him if he messes them up. Oh, and yesterday Dan lent me 300 gold so I could by my Epic Flying Mount (costs 5000g for training plus 200g for the mount). I chose the Swift Red Gryphon. He is blazingly, blindingly, brilliantly fast! Now I need to figure out if there are any special quests I can access now that I have him. The house is a filthy cluttered disaster area. Argh. I think I’ll ask the boys to haul some extra crap out to the garage today. That might help a little. I felt awful yesterday but slightly better this morning. Maybe I’ll be able to get some housework done soon. Yesterday we drove up to the fairgrounds in Del Mar (it’s the racetrack, really, but they do lots of other things there when it’s not racing season) to pick up our fair entries — Henry’s dragon collection and my sweater and fern lace scarf. We both got blue ribbons, and I got a fancy yellow rosette because of my Donated Award from Common Threads, a $50 gift certificate. Also went to another doctor for a second opinion and more tests. She thinks my Strange and Very Painful Condition is shingles, which is what I think too because it makes more sense than anything the first doctor suggested, and that’s also what my ER doctor friend thinks. Ugh. Whatever it is, it hurts like hell. The first doctor I saw (who was open on the Fourth of July, thank goodness, which is when my Strange and Very Painful Condition erupted) didn’t think of shingles so now I get to go get my blood drawn again. Hooray! 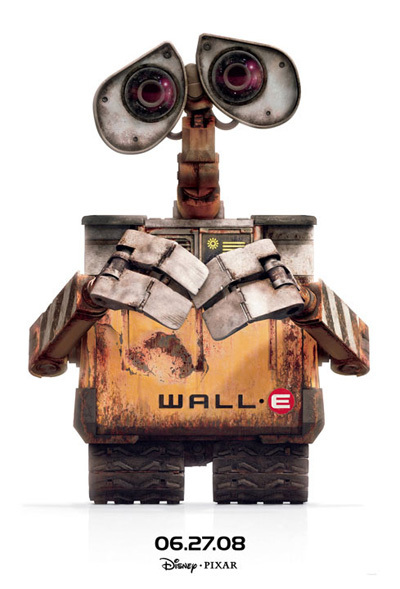 Henry and I went to the 9:30pm showing of WALL-E last Wednesday. 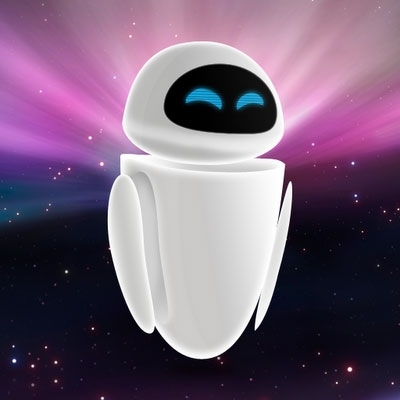 I case you live in a cave and don’t know it, WALL-E is the new Pixar movie. I hadn’t seen any commercials or previews, hadn’t read any reviews, hadn’t looked it up on rottentomatoes or wikipedia, so I had no idea what it was about or what it would be about. All I knew was that Henry had seen it and liked it and thought I would like it too. Henry was right. I loved it. I loved every minute of it and I’ve been thinking about it ever since. The characters are appealing, it’s beautifully made, it’s warm and romantic and optimistic, and it’s funny without the stupid in-your-face loud vulgar annoying wisecracking animals so common in kids’ movies. Arghhhh twitter.com is down, and http://identi.ca (an exciting new open-platform microblogging thing that just went live yesterday) is down. I’ve been beta-testing identi.ca for a while and doubted that it was sturdy enough to go live already, and now half the people I encouraged to try it will be frustrated and give up. Sigh. Poor identi.ca. I’m sure it will be back soon and then everyone should try it. The plan is, someday, that it will read stuff from twitter and all the other microblogs so you don’t have to convince your friends to switch. You can find me on both twitter and identi.ca — I’m “kayray” of course. Off to drop Henry at Kung Fu. Was planning to shop tonight but will put it off till tomorrow or Saturday. Our backyard container tomato plant. We ate this tomato for lunch one day and it was so good! And there are more ripening right now! Far too big for my skinny feet and the pattern doesn’t lend itself to alterations. I think they will fit Chloe, though. I really like this heel! You turn it with short rows and then work the heel flap as usual but with this lovely cable and seeded ribbing pattern. Turkey Stampede at the fair. Hilarious. The RC truck had turkey chow in the back so the turkeys chased it like anything. I just dumped half a box of oatmeal on the kitchen floor, but it was uncooked and easy to vacuum up. And that was a lot better than the time I shook the bottle of salad dressing with the cap off, and the time I knocked my big cup of coffee on the floor, and the time I nudged the beer bottle off the top of the fridge and it shattered. I swear. Clumsy, who me?